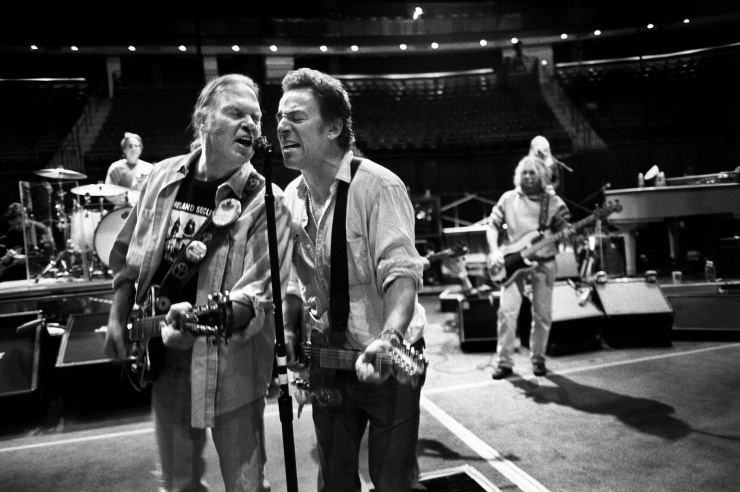 Neil Young News: The Difference in Greatness: Bruce Springsteen or Neil Young? The Difference in Greatness: Bruce Springsteen or Neil Young? Back in 2006, we did a rather extensive look at the whole Bruce Springsteen and Neil Young mythologies in the posting Bruce Springsteen and Neil Young: The Difference in Greatness. Our regular readers know we're always up for a spirited debate on the relative merits of our respective musical heroes. And of course -- as we always predispose -- it's not a competition and there are no winners and losers. Only players. Well, Bruce is a great artist and a great guy too. Bruce has this attitude of crowd pleaser. Neil has probably more artistry than Bruce. Neil seems less conditioned by the fame and money than Bruce. Neil, at a certain point of his career, chose the ditch. I hardly could think now about a concert of Harvest or After Gold Rush songs. Bruce plays for the stadium masses and can play the entire Darkness, BITUSA albums for the fans. Neil plays for himself according to his actual vision. Bruce plays 150 songs, Neil his preferred 15 for that tour. I think that recording contracts of 70,000,000 dollars or playing in the stadiums have a price on your artistic freedom. Neil "plays" in a smaller scale. Finally, Bruce wants to be great. I don't know, but he has 15 people playing with him. Neil plays solo or with 3-4 people. Often the Boss productions are overblown. Bruce "butchered" his old Darkness outtakes with new overdubs for his Promise album, Neil just edited a couple of songs for his Archives. Both great artists, but I love more Neil. It's challenging to be a Neil fan. Both are brilliant artists. But I much prefer Springsteen's music. I find I rarely listen to Young, but I often listen to Springsteen. Springteen has continued to do great work late in life. I don't think Young's recent work has been anywhere close to the caliber of his earlier work or of Springsteen's later work, so much so that I mostly stopped keeping up with Young after Mirror Ball -- I did hear his last few albums and didn't like them much at all; I though the songwriting on Psychedelic Pill was weak; Americana while it sounded like an interesting idea for an album didn't make for very good listening, Le Noise was just bad and underbaked. By contrast I think some latter day Springsteen, like Magic and Wrecking Ball, were excellent albums. So, I could make the argument that Springsteen's better because he's remained more consistent and more consistently good throughout his career. But of course Young's more prolific and more of an experimenter which is one of the things that's great about him although it's a quality that I think has produced spotty results. It's really just preference. Springsteen's music interests me more and touches me more, but I have profound respect and admiration for Neil Young. One thing I would disagree with for sure is Caryn's observation that Springsteen worries too much about what his fans think and doesn't take enough chances. I would actually compare the Springsteen of the nineties to the neil Young of the eighties in many ways. Think about it. Neil confounded his fans in the eighties by making a string of wildly experimental genre-bending albums...from the electro synth of Trans to the rockabilly of Everybodys Rockin to the country of Old Ways. Bruce meanwhile confounded his fans in the nineties by firing the beloved E Street Band; releasing two albums simultaneously with a group of non-descript studio musicians and then touring with the same; and then pretty much disapearing off the radar altogether for the rest of the decade save for a decidedly dour and non-commercial record based on a Steinbeck novel (Tom Joad). Right now, Neil is basically back on track doing one of the two things his fans love (there's that duality again) with the Prairie Wind/Heart of Gold accoustic thing. From what I read of his speech at SXSW, his next move is going to be a "loud one", which should please those other fans who dig the cranked to eleven thing. Meanwhile, Bruce is doing an album of cover tunes by a folk music icon...complete with the fiddles and banjos...less than a year after a solo accoustic tour. Personally, I'd be lying if I said "The Seeger Sessions" has me exactly quivering with anticipation. To be honest, the song snippets I have heard from that record thus far haven't thrilled me much either. 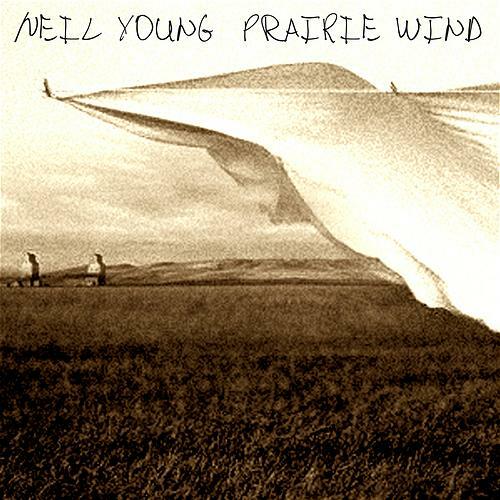 And much as diehard fans like myself will tell you they liked Nebraska and Devils and Dust (both of which I did very much), I would also maintain that the quiet accoustic sound just sounds a lot more natural (at least to me) when Neil Young does it. So you tell me who is the artist most pleasing his fans right now? The E Street Band aren't getting any younger and with every minute Bruce spends exploring his "inner folkie", the clock ticks down on the possibility of one last E Street album and tour. Quite the contrary. Bruce seems to have no problem exploring his muse and basically saying "Folk You" to those of us fans who don't like it right now. Thanks Glen and all for your Bruce & Neil thoughts. 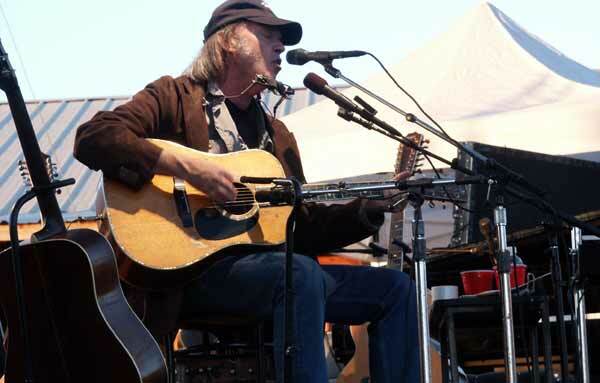 Over the years, Neil Young has intersected with a wide variety of artists like Bob Dylan and Pearl Jam. Another interesting musical intersection is that of Bruce Springsteen and Neil Young. "Other than, say, Bruce Springsteen, who else has better expressed the late 20th and early 21st century American experience? Whether it was "Ohio" or "Rockin' in the Free World," or "Southern Man" or "Unknown Legend" or even "Old King," Young has always given voice to the meaning of life among the amber waves of grain, the crack-laden neighborhoods or the romantic longing of an American heart." "Springsteen is both the most populist and (in terms of sales and live audience) the most popular. His songs spring out of the American maverick tradition with echoes of Steinbeck, Kerouac, Ginsberg and (in his new collection) Cormac McCarthy. His music has the blood of tradition in its veins and high art in its sights. Yet unlike many of his singer-songwriting peers, Springsteen does not neglect his role as an entertainer. With the E Street Band, he comes from the American school of road-tested rock and roll that has, in lesser hands, given us so many efficient but essentially soulless showbands. Springsteen combines the best of two very different worlds, the highly personal songwriter and the crowd-pleasing entertainer. He is, in effect, Bob Dylan and Elton John rolled into one. It is an unusual but compelling combination that makes him arguably the greatest solo performer of all time." "Neil Young constitutes with Bob Dylan and Bruce Springsteen the great triad of 'moral' voices of American popular music. As is the case with the other two, Young's art is, first and foremost, a fusion of music and words that identifies with his era's zeitgeist. Unlike the others, though, Young is unique in targeting the inner chaos of the individual that followed the outer chaos of society. While Dylan 'transfers' his era's events into a metaphysical universe, and Springsteen relates the epic sense of ordinary life, Young carries out a more complex psychological operation that, basically, bridges the idealism of the hippy communes and the neuroses of the urban population. His voice, his lyrics, his melodies and his guitar style compose a message of suffering and redemption that, at its best, transcends in hallucination, mystical vision, philosophical enlightenment, while still grounded in a context that is fundamentally a hell on earth." "I actually found one comment interesting...and that was the one about comparing Bruce fans who miss the E Street Band to the way Neil fans miss Crazy Horse. Neil has carved out a very effective "duality" in my view. The quiet, accoustic Neil resonates every bit as effectively as the cranked up to eleven Neil does. When Neil is doing his full on, cranked up to eleven electric thing, it's more about Neil's guitar playing than it is about the band (Crazy Horse)." "Bruce, regrettably, cares a little too much about letting his fans down. He needs to take more chances, not less. Neil doesn't care whether or not the fans get cranky, as evidenced on the Greendale tour and what happened with the audience reaction there. Neil just GOES. They are wildly divergent personality types and you might as well compare Springsteen to Sinatra." So with the setup of compare, contrast and discuss provided by Dr. Eric Alterman's "greatness" quote above, The Jukebox Graduate and blogger Glen's response to Thrasher's strawman argument, here's a look at the fascinating intersections of Bruce Springsteen and Neil Young. 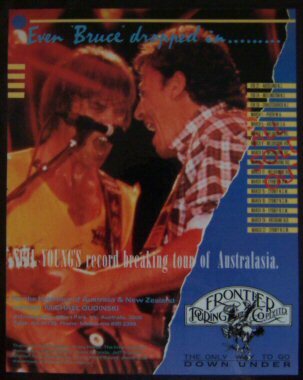 On March 22, 1985 in Sydney, Australia, Bruce Springsteen joined Neil onstage for an encore performance of "Down By The River". 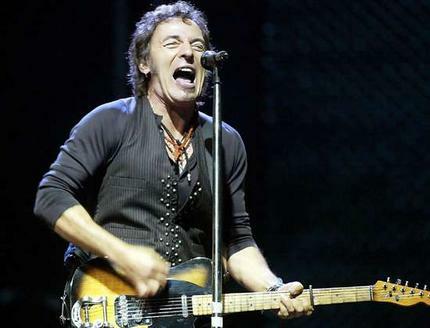 Bruce had performed the night before at Sydney's Entertainment Centre (3/21) and performed again the next night (3/23). In between Bruce's two concerts, Neil Young was scheduled to headline the Benefit for the Australian Cerebral Palsy Association concert. As noted in poster above, Neil's entire 1985 Australia tour was "ALL SOLD OUT". 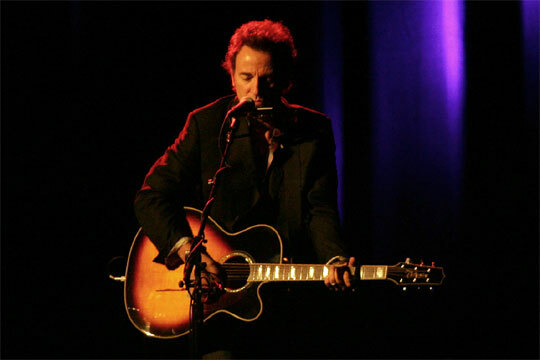 Nils Lofgren, touring with Springsteen, joined Young onstage for several songs, including "Comes A Time" and "Helpless". 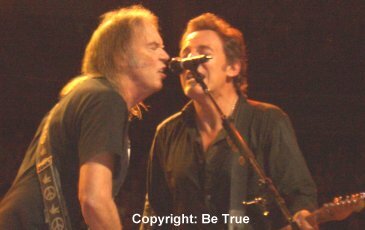 At the conclusion of the 28 song setlist, Young invited Springsteen on stage. Bruce sang vocals on an amazing 20 minute version of "Down By The River". Springsteen joined Neil for an encore of "Down By The River" at Jones Beach, New York on June 14, 1989. Bruce is virtually inaudible on the tapes of the show. 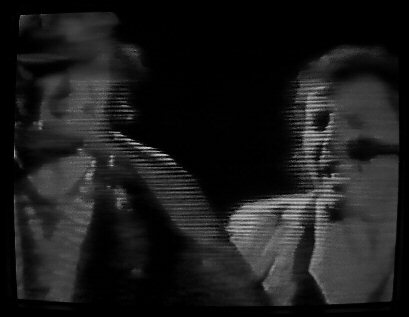 If Thrasher had not seen the video of the performance, it would have been hard to believe both Neil and Bruce sang at the mic. Bruce Springsteen and Neil Young's music and careers have as many similarities as dissimilarities. 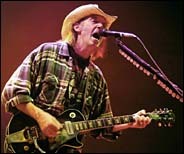 Neil Young's "Rockin' in the Free World", has been compared with Bruce Springsteen's "Born in the USA," due to "the anthemic use of this song was based on largely ignoring the verses, which evoke social problems and implicitly criticize American government policies." (1) Neither artist has sold their songs for use as commercials, leaving them among a small handful not to do so. Another Bruce and Neil connection occurred at the Academy Awards on March 21, 1994. Coincidentally, both Springsteen and Young were both nominated for Best Song in a Movie -- and in the same film -- Jonathan Demme's "Philadelphia". 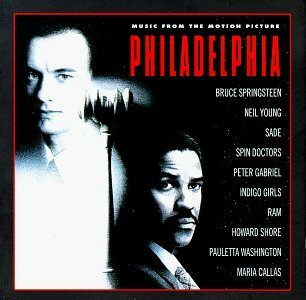 Bruce's nominated song was the film opening "Streets of Philadelphia" and Neil's was the closing title track "Philadelphia". In 1994, Bruce Springsteen, Bob Dylan and Neil Young joined on stage at the Roseland in New York City to perform 'Rainy Day Woman' and 'Highway 61 Revisited'. At the 1995 Bridge School Benefit Concert, Springsteen joined Young for an encore of 'Down by the River'. Young remarked: "Bruce says he doesn't have any more songs, so we'll do one of mine". At the 2004 Vote For Change concert in St. Paul, MN, Neil and Bruce jammed together on "All Along the Watchtower" and "Souls of the Departed". "Bruce Springsteen and Neil Young have both been playing this sort of acoustic, singer/songwriter-type music for more than 30 years, so it’s not a crime if they repeat themselves from time to time. On the other hand, it surprises me when other writers blatantly ignore the fact that none of this is worth listening to more than a couple times – especially if you already own the artists’ older albums. UK writers always have a flare for the dramatic, but I think Guardian pushes the limits by calling Prairie Wind, “one of Shakey’s best.” Outrageous. 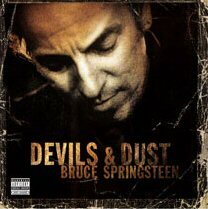 Rolling Stone gave Devils & Dust 4 ½ stars, which seems incredibly polite." As for reviewer Ben French's comments above, we're looking forward to Springsteen's upcoming Seeger Sessions and the crimes of artists repeating themselves from time to time. "Springsteen, because he has maintained a consistently high level of commercial success over the years, is a sell-out, and a manufactured creation of his manager. Whereas someone like Neil Young, because he hasn't been ashamed to release some real crap, is an artist of integrity, who won't give in to crass commercialism, by always giving his fans music that they will actually enjoy." More Bruce and Neil mashups from the land of wheat fields and blog-ville [search]. Also, read more on other Neil Young collaborations, influences and mashups. Attending concerts you can see the difference Bruce is more corporate and his fans have stayed loyal as he's kept his quality control reined in for his songs whereas Neil doesn't really care if his fans don't like his music he does it for himself. Neil Young has retained a loyal fan base but smaller in number due to some of the stinkers he recorded in the last 20 years and I put Greendale in that. Having attended the Pill shows I'm afraid Bruce wins hands down and I don't think Bruce would cancel a tour because Nils Lofgren sprained his wrist! first off, anon @ 2:36, poncho didn't "sprain" anything. he FRACTURED his playing hand. Second off (and I really dig both Bruce & Nils) you are probably right. Bruce wouldn't cancel if Nils sprained his wrist, BUT HE SHOULD. Nils' guitar work carries the Estreet, IMHO. a couple of years back the wife and I caught Neil Diamond during an almost 2wk run he had going @ MSG. GREAT show! but what I remember coming away with was this; I now know where Bruce buys his cheese. from the Neil Diamond cheese eaters r us store. I have seen Neil play many different times in many different venues with many different band mates as well as solo and never once have I thought he's just like (insert ANY name here). Neil Young is an original, one of a kind. Bruce is a (talented) monkey see, monkey do act. Every musical act has taken something from somewhere. but Bruce s/b paying Neil Diamond a royalty every time he appears anywhere with anyone. Neil Young. Sponsored by No One. I think in terms of writing great songs over the whole span of their careers both Bruce and Neil are equals. This drug thing(or maybe just personal philosophies) could also be seen in the difference between their writing. Neil's songs are generally emotion based, straight from the subconscious, unedited. Bruce, I think, is more conscious in his writing, where he can take a preconceived idea and write it and rewrite, maybe change the melody or slip in a verse from some other song, and very much follow a line of thought thru his songs. Like Bruce can write about anything thing, and he is better at whipping off a good pop tune. Really 2 of the greatest songwriters we'll ever see. In my opinion only Bob Dylan and Ray Davies can be placed alongside Bruce and Neil. I seriously doubt Neil would ever try stand-up! I still go back and forth on this. I think 90s Neil beats 90s Bruce hands down. But I also think Springsteen's post 2000 work has for the most part been a lot stronger than Neil's (although I liked Psychedelic Pill more than I did Wrecking Ball). Live, I have to give Bruce a slight edge. I saw both artists 2012 shows weeks apart from each other, and both of them killed it. NY with Crazy Horse is about as good as it gets, but could be even better if they mixed up the setlists the way that ESB does. Knowing the exact order of a setlist before a single note is played is something that just doesn't happen at Springsteen shows, at least not outside of the open and close (and on the last tour, even that got mixed up quite a bit, especially in Europe). That said, the NY/CH show I saw in Seattle was just crazy intense - probably the best Horse show I've seen (and that includes Ragged Glory/Weld). It's kind of a tomato/tomatoe thing really. Bottom line is I love both of them. I guess what it really comes to is that with a Springsteen show, I know there is at least a chance of getting some really off the wall personal favorite like "The Price You Pay," "The Promise" or "NYC Serenade." For me, it was "Drive All Night" in Portland on the last tour. With NY, I knew - KNEW - going in, there was zero chance I'd hear some equally cool rarity like "Southern Pacific" (ReAcTor style) or "Danger Bird." On the other hand, it was sure cool hearing "Ambulance Blues" on the Chrome Dreams II tour. But even there, by the time that tour played Seattle twice, I knew I'd be hearing it again a second time. What would've been cool would be if he'd swapped out that slot for "On The Beach". Thanx for the shout, Thrasher! I grew up with both Neil and Bruce, but Neil has always been in my favor. I am a firm believer in the Greendale album, but I was always opposed to call it an "actual" Crazy Horse LP. It has a simple sound to it and there is nothing complicated about Neil's message. People don't like it because it is different, but not so radically different than the Time Fades Away tour. Greendale will become a classic someday, in the same way I feel Americana will as well. For Bruce, I think The Rising is a remarkably better album than Devils and Dust (although I do enjoy the acoustic element when Bruce brings it present), and I hold Nebraska up there as Springsteen's version of On The Beach because it is stripped down enough where his characteristics are present but not entirely lost. Overall, just a remarkably different, yet powerful album. Wrecking Ball is the first Springsteen album that I have listened to where I instantly fell in love with the songs the first time I heard it entirely (the last time this happened was with Darkness On The Edge Of Town). I think it's because the E Street band wasn't so much in my face like in The River or even Born In The USA. I know that the horn section and the strings present in the E Street band give Springsteen his "sound" (and an element that Dave Matthews would also adapt), but overall Springsteen still has a strong vibe considering the loss of Springsteen's own Longgrain, Clarence Clemons. And Neil, without Ben Keith and some of his other close counterparts, can still produce some great rock and roll. Le Noise is an album that grows on you (Because it is much more abstract than albums like Trans), and I love Americana because everyone else didn't and because it is the first real Crazy Horse LP since Broken Arrow (And with the way things seem now, these folk songs could go much further, but only the Carnegie Hall appearances will spell out whether another folk album is in the mix). Psychedelic Pill blew me away after I was first exposed to the majority of the songs after seeing the Horse at Red Rocks last August. It was my first Neil show and, hell, it was a great one, only if I had waited for Alchemy to see the other deep cuts. But Pill has a powerhouse within it and proved that Neil could capture those extended live jams onto a 3 LP/2 CD set. Psychedelic Pill is the perfect soundtrack to Waging Heavy Peace and without reading it or listening to it, Neil's overall sound quality rant would not make sense (Which could be why people didn't like the book or the album). It is nice to see these two powerhouses create remarkable LP's after both of their greatest counterparts had passed away, and it shows a longevity that is everlasting. Although I feel that Springsteen's decisions are based off the greater good idea (like replacing Clemons with Clemons' son) and Young's are based off of personal, end-of-an-era-like ideals (retiring all songs that featured Keith when it comes to band performances, his cancelation of the remainder Crazy Horse dates) where he feels that the music can't go on without the people that make the music stand out. As far as the rest of the debates goes, I feel that Live At The Cellar Door will be much more rawer, new and overall more successful than Live At Massey Hall (Although it is a stellar LP) and this whole Archives debacle is one that will blow over. Almost everyone could wait 20 or more years for the first set, but cannot wait more than 3 or 4 for the second one. I am still waiting for the early Crazy Horse recordings Neil was talking about in Waging Heavy Peace. But it due time, they will come. I will always like Neil better than Bruce, but I respect them both equally. But Hell what do I know, I am only 19. Probably the youngest Neilphyte I know. Thanks for the correction anon 4:29 with regard to the injury. A good debate. In fact, in the last 5 years I've seen Bruce, Neil and Nils Lofgren live - and to throw a spanner in the works here NILS was the best show! Ok so he's not made the classic records but as a live show takes some beating. I have seen Neil 10 times and Bruce near 30... More chances from NJ. Neil changed my life in my teens, with his vinyl I'm 49. Bruce changed the way you go to a concert. Best 2 artist alive. No single artist had a decade like Neil in the 70's, comparable to the Beatles in the 60's. Nobody ever is as good as Bruce live period. Neil is the superior solo, just mesmerizing. Later recordings loved Greendale and devils and dust. Not so much Magic or Americana. Flat out dead tied. Bruce has the ability to put tough words on cheery music. Neil has the ability to put good uplifting words on down music....it's great. @Glen - yes, Neil setlist variation (or lack thereof) is something that comes up continuously. From what we sense, it seems many folks only see one show per tour. And for many, it's one of their few chances since Neil tours so infrequently relative to Bruce. @ trevlom - lots of good thoughts on Bruce & Neil. Thanks. Interesting on thinking that Live At The Cellar Door will be more successful than Live At Massey Hall. Massey Hall is very fine and has those songs with wide appeal -- HoG, AMNAM, OM, etc Just from the preview trailer, it sounds like the recording quality may be higher for Cellar Door. It will certainly sound more intimate than the very intimate Massey. Such a subjective question, but all the fun ones are, right? Chervokas says that Springsteen's recent albums are on par with his best work, but Young's recent albums are no wear near his peak. Meanwhile, I think the opposite is true! They both were honered Musicare Person of the Year! So there's no difference between the greatness of Bruce Springsteen and that of Neil Young. I really don't like Bruce Springsteen and in my humble opinion I think Neil Young is the greatest rock artist ever. Bruce Springsteen is, as a European, way to American for me. I don't like his themes and his kind of macho attitude. The way he strikes his guitar like a lumberjack, I'm sorry, but I just can't watch it. And that dreadful voice, please no. I just can't stand him, I can't help it. Too much show, little real human emotion, something in which Neil Young excels. Neil seems more honest and more emotional to me. Come on man, Bruce is touring all the time with a Horse and Neil doesn't... He should do it, but he doesn't. Bruce is the man! Fork In The Road ...emotional? Springsteen gets the nod for me but ahead of both them is the GREAT ..Dave Alvin puts them both in the shade in the last 20 years. Bruce has never caused me to tear up just by hearing the sound of his acoustic guitar & harmonica. One chord from Neil can pierce my heart - I just can't explain it. My concert introductions to each were Rust Never Sleeps and Born in the USA, and BOTH blew me across the room. I have seen both several times since, alone and with Crazy Horse and E Street Band. It's an event no matter which one is playing. Great vibes, crazy fans, excellent musicianship. Old faves and new tunes, some obscurities usually thrown in as well. Never saw a theatrical show like RNS before that, and BIT-USA tour was 3 1/2 hours non-stop with the crowd doing the "wave" for at least a 1/2 hour straight - F'in nuts. Bruce is a crowd pleaser for sure. Plays right to it, orchestrates to it. But its a "pop" show for the most part to me. Great songs, but too scripted in its presentation and follow- thru. Too much pandering, but the casual fans eat that sh%t up. Maybe even his diehards. The solo show I saw put my brother to sleep. Not me, but not far from it. Neil, though scripted in the songs played each night for the most part, delivers a whole lot more instinctive soul and feel, and you never know what's totally in store inside each song, especially with Crazy Horse along. Could be 5 minutes, could be 20. It can almost be a séance. But that's the deal. And the draw. I wouldn't decorate the Christmas tree with just one ornament, so these two are certainly deserving for their role in the American music landscape. Rabid fans are just the reward for sticking with their own game, and muse, and integrity. Just different flavored candy, but both so sweet. vs may be relevant in a sports contest but not in comparing music of this standard.I am just grateful that I appreciate an art form which produces 2 such stupendously talented and enduring artists. Actually in music right now it's Bob, Paul and Neil, then everyone else. Objective art is meditative art, subjective art is mind art. Charlie Brown: Lucy, how would you like to play second base? Lucy: NOT ON YOUR LIFE!! I'VE GOT TOO MUCH PRIDE! Charlie Brown: Well, what in the world is wrong with second base? Lucy: Second base? Oh, pardon me...I thought you said "Second Fiddle"! "Kick is seeing things from a special angle. Kick is momentary freedom from the claims of the aging, cautious, nagging, frightened flesh."